Add a free personalised iced message to your cake? Golden sponge cake filled with raspberry jam & vanilla buttercream filling, covered in soft white icing with coloured sugar-paste decorations. 20cm. 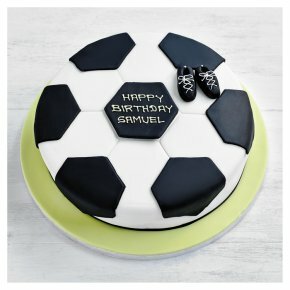 You can personalise this cake with a hand-piped message of up to 30 characters, including punctuation and spaces. Also available in a larger 25cm size. Perfect when paired with our Fiona Cairns Football Cupcakes.